I slipstreamed ALL those available drivers onto the CD like you suggested Fernando. Plugged HDD into the Orange SATA Intel ports, set AHCI Mode to 'Enabled' and set 'Onboard SATA/IDE Ctrl Mode' to 'AHCI'. Started up the Windows installation, 'Setup is Copying files' then pressed Enter when it gets to the 'Install Windows XP on Hard Drive'. Then it takes me to that screen, AGAIN! ''No hard drive detected, Press F3 to quit setup''. So i quit setup, set AHCI Mode to 'Disabled' but left the Onboard SATA/IDE Ctrl Mode to AHCI. Went through the process, this time it found the HDD. I formatted, went through the 'Copying Files' process etc, then reset PC. Before entering the actual Windows installation, i went back into bios and enabled AHCI Mode. Reset. Got to the Windows logo 'loading' screen to carry on the installlation and i get a bSod!?!? For f*** sake what am i doing wrong? If i start all over again but with Slipstreamed Gigabyte druvers and plug it into the GSATA ports (Gigabyte SATA) and leave 'AHCI Mode' to 'Enabled', but Onboard SATA/IDE Ctrl Mode to 'AHCI' i get the 'Intel AHCI Bios' during post telling me 'AHCI Bios Not Installed'. However, using the GSATA ports and the Gigabyte drivers, i can install Windows, but obviously not with AHCI enabled, and no extra features, or am i mistaken? I just don't know what to do. I want to install INTEL AHCI with AHCI MODE ENABLED in my Bios, the Gigabyte 'process' just seems sucky and i can't have 'AHCI Mode' enabled. Am i doing the setup wrong? Should i leave AHCI Mode disabled until Windows XP is fully installed to get it to work? EDIT: Do you know what? I just don't think my Motherboard supports INTEL AHCI. My HDD needs to be in the GSATA ports, and i need to slipstream the Gigabyte 'Jmicron' controller drivers. But even then, when that is done, enabling 'AHCI Mode' in Bios causes the bSod. Which makes me wonder if this board supports AHCI at all, and if it doesn't, why the hell is it in the Bios? Does the 'AHCI Mode' only relate to Intel, while the 'Onboard SATA/IDE Ctrl Mode - AHCI' relates to the Jmicron controller? What do you think? EDIT: Do you know what? I just don't think my Motherboard supports INTEL AHCI. My HDD needs to be in the GSATA ports, and i need to slipstream the Gigabyte 'Jmicron' controller drivers. That's right. Windows Setup is not able to recognise a JMicron S-ATA AHCI Controller connected hdd, if you load the Intel drivers. Your motherboard obviously has an Intel ICH8 southbridge (and needs the Intel INF chipset drivers), but has not Intel S-ATA Controllers at all. If you want to use the AHCI features (which is recommended), you have to enable "AHCI Mode" within your BIOS and slipstream the Gigabyte (=JMicron) S-ATA textmode drivers. But even then, when that is done, enabling 'AHCI Mode' in Bios causes the bSod. You have to enable the "AHCI Mode" before you are going to install a Windows OS. Which makes me wonder if this board supports AHCI at all, and if it doesn't, why the hell is it in the Bios? Does the 'AHCI Mode' only relate to Intel, while the 'Onboard SATA/IDE Ctrl Mode - AHCI' relates to the Jmicron controller? Your motherboard supports AHCI, but the SATA AHCI Controller is the JMicron one. The S-ATA feature "Advanced Host Controller Interface" (=AHCI) was created by Intel first, but other chipset manufacturers are doing the same now (even NVIDIA recently have put the AHCI feature into their newest S-ATA Controllers). So, i need to plug SATA cable into the Purple (GSATA) ports, Slipstream the Jmicron SATA drivers AND the Intel AHCI drivers into the XP disc, but not one or the other, BOTH must be on the disc? Or do you mean, i should slipstream just the Jmicron drivers, with the SATA cable in the GSATA ports, and follow the XP process this way. All the while with AHCI Mode enabled? EDIT: Basically, jsut to get this process confirmed. I'm going to get the Gigabyte SATA_SATA2_RAID driver from the Gigabyte website and im going to get the extracted Intel Matrix Storage Manager drivers from Intel. I'm going to integrate BOTH these drivers into an XP installation. Set Bios to AHCI Mode, with HDD plugged into GSATA ports (Or Intels?) and run the installation. With the SATA2 Gigabyte drivers (Jmicron) on the installation, it should enable my motherboard/chipset to SEE the Intel AHCI driver too? EDIT2: Also, if you mean to just Slipstream and install the Jmicron SATA drivers with my HDD in the GSATA slots, then like i said before, with AHCI mode enabled in Bios, i get a quick screen during POST telling me 'Intel AHCI Bios Not Installed'. Which makes me think its not running in AHCI mode at all, meaning i do need Intel drivers installed? This is truely the most aggrevating, confusing, tedious and most time consuming project i have ever undertaken with my PC. So i appreciate this help Fernando. No, as far as I understand Gigabyte's homepage your mainboard doesn't have any Intel S-ATA Controller. 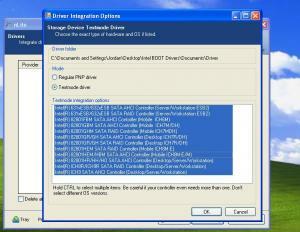 So you only need to integrate the Gigabyte (=JMicron) SataRaid driver package as TEXTMODE driver. Yes, that is what you should do. EDIT: Basically, jsut to get this process confirmed. I'm going to get the Gigabyte SATA_SATA2_RAID driver from the Gigabyte website and im going to get the extracted Intel Matrix Storage Manager drivers from Intel. I'm going to integrate BOTH these drivers into an XP installation. No, as I already wrote, you should not integrate both Intel and JMicron drivers. Set Bios to AHCI Mode, with HDD plugged into GSATA ports (Or Intels?) and run the installation. With the SATA2 Gigabyte drivers (Jmicron) on the installation, it should enable my motherboard/chipset to SEE the Intel AHCI driver too? I don't understand, what you mean. AFAIK your motherboard doesn't have any Intel S-ATA Controller. If I am right, you have no choice! When your motherboard doesn't have any Intel S-ATA Controllers, the post message is correct and just means, that only Gigabyte AHCI Bios is installed. You are obviously confused now, but there is nothing to warry about. At first check your mainboard manual, if you have any Intel S-ATA Controllers on board (obviously you don't, because Gigabyte doesn't offer any Intel S-ATA or Raid drivers for your motherboard). 1. Create a bootable XP CD with slipstreamed 32bit Gigabyte (JMicron) S-ATA drivers (integrated as textmode). 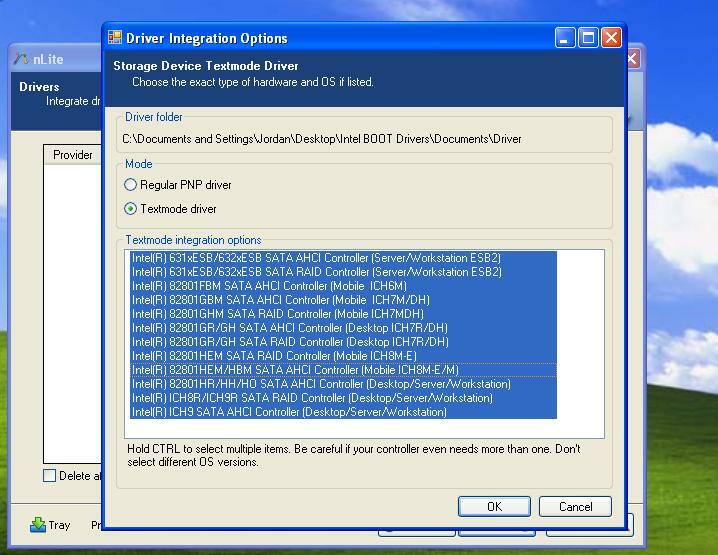 You can additionally integrate the Intel INF chipset drivers as PnP drivers (these INF drivers are not needed at all during the installation and have nothing to do with S-ATA or RAID connected hdd!). 2. Then prepare your mainboard BIOS for the Gigabyte S-ATA AHCI mode. The S-ATA Connector, where your hdd is connected, should be enabled and set to "AHCI mode". 3. Then boot off the nLited XP CD with the integrated Gigabyte SATA AHCI drivers. Thankyou so much Fernando, i will carry this out, i know it will work this time. I'll let you know how i get on mate. Thanks so much for the help and guide. EDIT: I think also, the two settings in the Bios are confusing. There is an 'AHCI Mode' Disable/Enable, and then there's the Onboard SATA/IDE Ctrl Mode - AHCI/RAID-IDE/IDE. Enabling the 'AHCI Mode' brings up the Intel 'POST' screen i described above. Enabling the 'AHCI' toggle next to Onboard SATA/IDE Ctrl Mode brings up a Gigabyte SATA2/IDE Bios during POST as well. Which makes me believe i should disable the 'AHCI Mode' setting (For Intel) and just leave the 'Onboard SATA/IDE Ctrl Mode' set to AHCI (To show the Gigabyte SATA2/IDE Bios during POST) What do you think? Should i just leave both enabled and ignore the Intel POST Screen? Thats what i get when i select the 'X32' drivers after navigating to the GSATA folder. It's either those, the X64, the Jmide, or the Floppy32/Floppy64 drivers. Are they the right ones, and why are they only PNP mode? Also, should i run the GSATA installer after i have re-installed OS as well? I just have downloaded and read the manual of your mainboard. There are 4 Intel ICH8 S-ATA ports (close to the border of the board) and 2 Gigayte (JMicron) S-ATA ports (near to the Intel ones, but closer to the center of the board). So you can decide which of the S-ATA ports (Intel or JMicron) you want to use. I recommend to take one of the Intel ports (0,1,2 or 3). If you want to connect your S-ATA hdd to an Intel port, you should enable AHCI for this port. As I could get only the description of the mainboard and not the BIOS details, I cannot give you any advice how to set the correct BIOS settings. If you are using the Gigabyte (JMicron) drivers for Windows XP, you have to download the Floppy32 drivers, but you have to enable TEXTMODE while integrating with nLite. I don't think, that you need to run the installer, if the drivers are already installed (by slipstreaming them). Indeed, which this is the problem ive been trying to describe. If i continue this slipstream in the Intel ports, i must install the Intel drivers, which, as you know, are not installing during the Slipstreamed setup! and another notice about ICH hubs - Intel offers ICHx and ICHxR versions. only R-labeled hubs support AHCI and RAID capabilities. I've spent a whole day trying to install AHCI on motherboard with ICH9 befor I looked at mb specification. As this guy said, i don't think my ICH8 chipset has an AHCI controller or something yet on Google people are saying it does, just Intel hasn't officially acknowledged it. Also, everyone says to go with the Intel ports for better performance! You can see the dilemma i am in. Argh! Why would you recommend the Intel ports over the GSATA ones anyway? If i continue this slipstream in the Intel ports, i must install the Intel drivers, which, as you know, are not installing during the Slipstreamed setup! b ) you had enabled TEXTMODE while integrating the Intel S-ATA driver? Why would you recommend the Intel ports by the way? Because they are better and have better support (more frequently driver updates). I'm definitely selecting them in text mode. There, i have them all selected, then i'd hit OK, and follow the guide through. Then create an ISO from it, mount that image, then copy the image onto a CD. Right? Do you think i should put the INF Intel Chipset drivers into the slipstream, maybe that will help it recognize the AHCI drive? I'm pretty sure i have all the BIOS settings setup correctly, but then again, maybe not. I've tried loads of different combinations. What i dont understand is why there are two 'AHCI' settings. The Onboard Sata/ide Ctrl Mode and just the 'AHCI Mode'. 'AHCI Mode' referring to the Inte i think and the Onboard mode refers to the Jmicron. Also, Onboard SATA 0-3 Mode: Native/Legacy mode? Which mode should that be set at for Intel? So **** confusing, i feel like a complete noob. It is a good idea to additionally integrate the INF Intel Chipset drivers. You didn't answer to my question, if your S-ATA hdd was connected to one of the Intel S-ATA port while installing XP. That is the most important point! Please check, where the S-ATA data cable from your hdd is connected. If you want to use the Intel S-ATA Controller features, you have to make sure, that the cable is connected to one of the Intel ports. If you are really unsure, you should enable the AHCI option for all S-ATA ports (Intel and JMicron) while installing Windows XP. After the successful install you can disable the not needed ports and AHCI settings. Yes, the cable (As ive said previously in other posts) is plugged into the ORANGE ports (Intel's) labeled SATAII 0, SATAII 1, etc. While the purple ones (Gigabytes) are labeled GSATAII 0, 1, etc. Okay, just now, i went into the Bios. Looking at my manual, the 'AHCI Mode' setting isn't even in the bios' manual, but it is in my actual Bios. So i read on, and in the manual, next to the 'Onboard SATA/IDE Ctrl Mode' it says 'These ports are controlled by the GSATA controller... Consult Intel for further information on the AHCI mode'? So, i selected the actual 'AHCI Mode' entry and Disabled it since there's no mention of it in the manual, but left the 'Onboard SATA/IDE Ctrl' to AHCI. This time the installation found my hard-drive but i think the installation would be pointless because i dont know if it even IS in AHCI mode this way? You can verify it after having completed the XP installation by having a look into the device manager. Either within the "IDE ATA/ATAPI" or in the "Storage Controller" section you should find a device like "Intel SATA AHCI Controller". Instead i put in the ordinary XP disc... It went through the same process, and recognized the HDD. This means the drivers had no affect. Some people are saying the Intel AHCI is powered by the Jmicron controller, maybe i should just go with that and install all the GSATA drivers instead. I just dont think this mobo supports the Intel method, i just dont know anything to do with this AHCI crap to be honest. You are right. This result shows, that no AHCI feature was enabled for the S-ATA port, which was connected to the hdd. Some people are saying the Intel AHCI is powered by the Jmicron controller, maybe i should just go with that and install all the GSATA drivers instead. You can try it, if you want. After having a deeper look into Gigabyte's informations about your mainboard, I found this statement within the FAQ section. So it is obviously true, that only the JMicron S-ATA ports of your board are supporting AHCI. Furthermore your mainboard has only an Intel ICH8 and no ICH8R southbridge. Intel ICH8 southbridges (without any letter behind the 8) do not support AHCI. I am sorry about the confusion, but normally it is not my task to find out the details and features of a special mainboard, which I have never used. Ok, I am able to get much further now. I can now use my nLite disc to install XP. which is causing the computer to go through reboot cycles because it thinks there are two operating systems and the first one is invalid, so it just reboots. I know how to fix it (by editing the boot.ini) however, I want to have a good disc. under boot unatended, the only thing I changed was I added the Windows Key. I have no other hard drives or partitions turned on when doing this. Anyone know why this would make a different boot.ini file?